TL;DR version: I played this in the early 1990s on an old 8088-based IBM-PC compatible; this is my interpretation of it. Play now at /armor-alley. Related: Development process, screenshots etc. Also on GitHub. 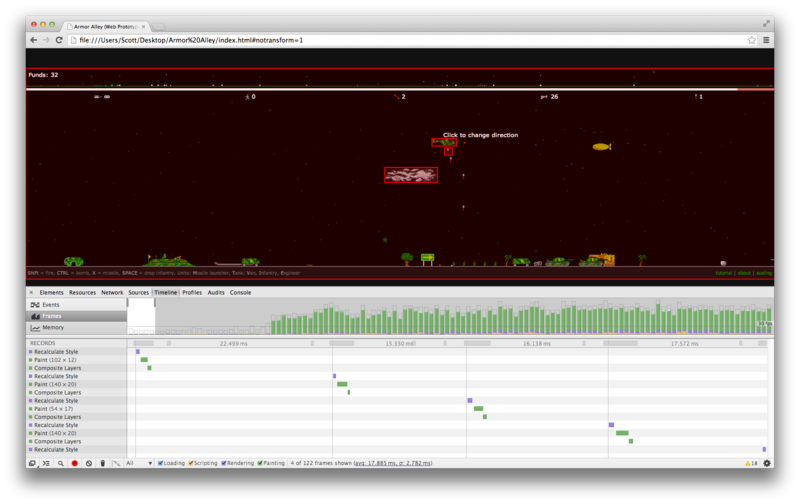 A browser-based interpretation of the classic 1990 game. 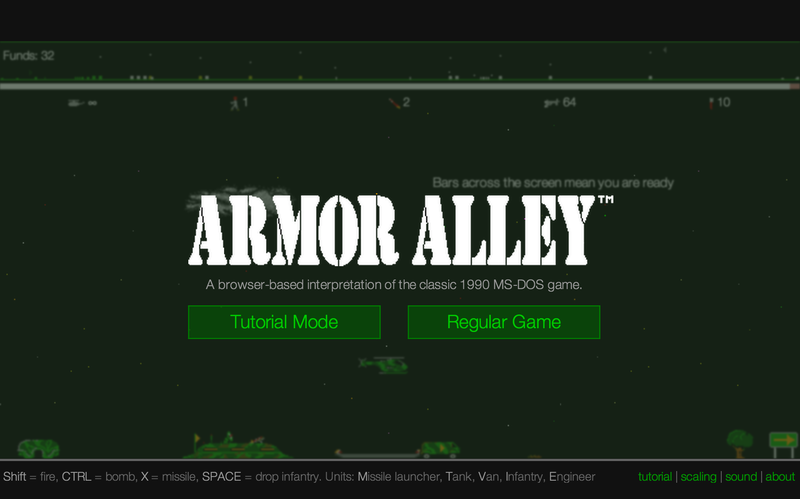 Armor Alley is a side-scrolling simulation involving strategy. The primary goal is to get a van across the battlefield to the enemy base. Of course, it is not that simple; the van is completely unarmed, and incredibly vulnerable. You must defend the van with a convoy of tanks, missile launchers and other units on the ground, in addition to providing air cover with your helicopter against identical enemy forces. 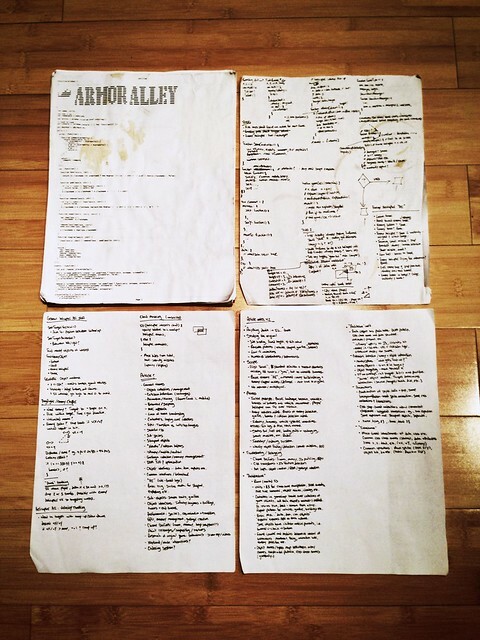 The Armor Alley Web Prototype home screen. Play it now or read more about the original game, units and strategy on Wikipedia. A quick fly through of the AA Web Prototype in tutorial mode. Basic mechanics, defensive and offensive tactics are explained. Performance and scalability are both important factors in building games, and both present learning opportunities in regards to writing performant code that is compatible with a number of platforms and devices. 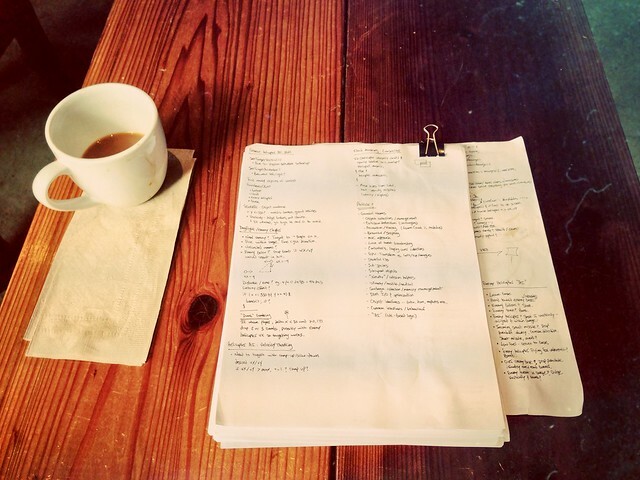 Regardless of fidelity, a working game prototype can be both educational and fun. Build and defend convoys of Tanks, Missile Launchers, Infantry, Vans and Engineers as they cross the battlefield, using your helicopter for both offense and defense. The goal is to get your van to the enemy base on the other side of the battlefield. 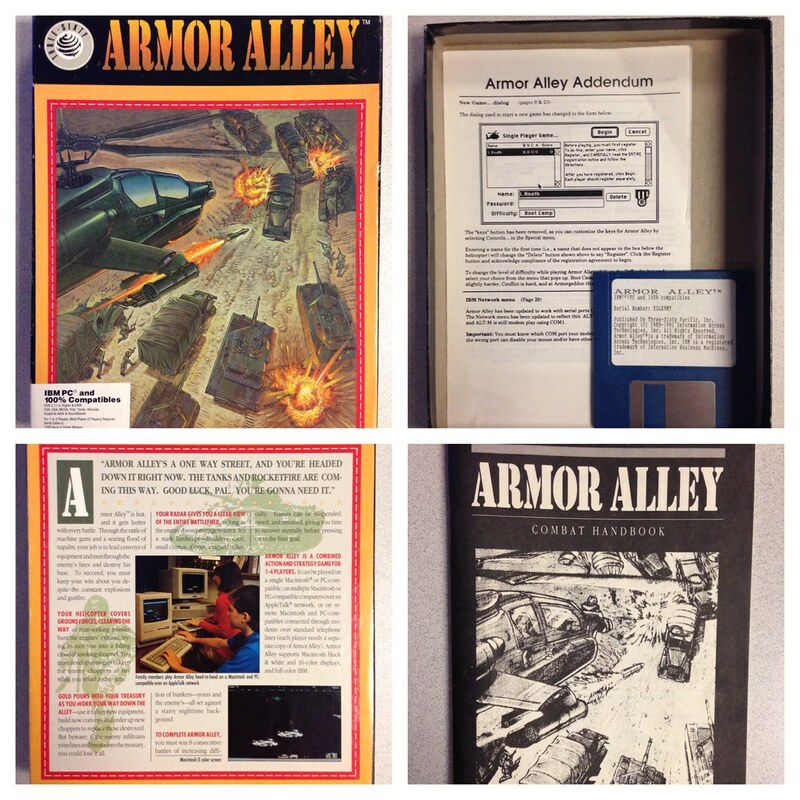 The original box: Armor Alley, PC-DOS compatible version (1990.) Thank-you, eBay. Numerous interactions / behaviours between vehicles in the environment. Numerous, but somewhat shallow and limited complexity; relatively straightforward implementation. First "level", standard vehicles and terrain elements including anti-aircraft turrets / "guns", but no armored bunkers. Basic enemy "AI", automated convoy building / ordering + enemy chopper actions / defense - likely difficult to truly emulate original behaviour. As with childhood family road trips: Source code, edited and annotated on the road. Initial prototype: Basic landscape, terrain, vehicles, bunkers w/balloons and vehicle movement. Player helicopter can fly over terrain. Enemy vehicles added. Basics of enemy detection, gunfire, bombs & collision detection added. Status bar, fuel line landing pads + repair / refueling / reloading actions. Smart missiles and radar system. 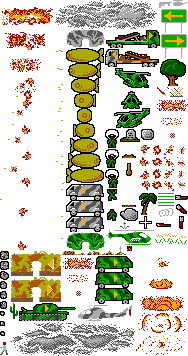 A tightly-packed sprite containing the majority of the in-game graphics, made for the Web Prototype. Good old-fashioned DOM elements for rendering UI vs. <canvas> or WebGL, etc. Benefits: Natural DOM createElement() for making game objects, CSS to style them, className-based manipulation, transitions and animations. 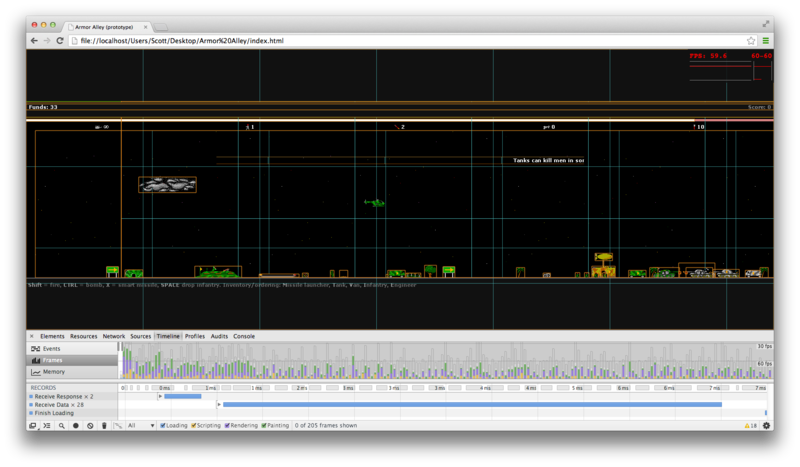 Controllers, i.e., gameLoop iterate over collections of game objects, calling each object's animate() method. If animate() returns true, object is dead and controller can remove it from the array. Pattern is repeated for collections of vehicles, gunfire, buildings etc. MVC-like theme: css, data, dom, objects interface is defined for major game objects. Some objects have child and/or parent objects, i.e., bunker <- chain -> balloon. Object names + types map between array names, constructor pattern, CSS class names (generally.) e.g., a van has data.type of 'van', CSS of .van, stored in game.objects.vans and so forth. Each object has a predictable DOM pattern, CSS class name and data structure. isEnemy applies to JS, cascades to .enemy in CSS. UI + collision logic, otherwise, is mostly the same. nearbyOptions - "who gets fired at?" nearbyObject() - "is an X (i.e., helicopter) in range?" Object targeting - "move toward the helicopter"
If there is an object overlap, call target.hit() and provide "source" object interface. Target determines interaction - i.e., target may die, but may also kill source. Combination of style.left/top, some backgroundPosition-based sprite animation, and CSS animations and transitions. animate() method applies vX + vY to x + y, updates style.top/left (traditional) or transform (GPU-accelerated) properties to reposition DOM node. Mixin-based inheritance of data, css structures etc. Common CSS class names (states), data attributes like x, y, dead, isEnemy etc. Common operations: Move sprite (DOM x/y), object hit, die are in left in a top-level common helper, similar to utils. Use transform: translate3d() where supported for GPU-based motion of elements on x/y axis, vs. traditional left/top style changes. Translate avoids expensive repaints, instead using GPU-based compositing for motion. JS: Avoid creating excessive garbage (e.g., cloning objects mixin-style) in hot/expensive loops; reduce GC, RAM use and overall churn. Pass objects directly / by reference, avoid creating new objects or modifying original object values in loops. Object destruction / clean-up: Remove node tree, JS/DOM references and parent array reference in the object collection case. Minimize DOM "I/O": Cache node references and coordinates to reduce reflow due to read operations (e.g., offsetWidth.) Update client coordinates only on critical events like init and window.onresize(). Web Prototype with GPU-accelerated transform: translate3d(), and room for improvement. 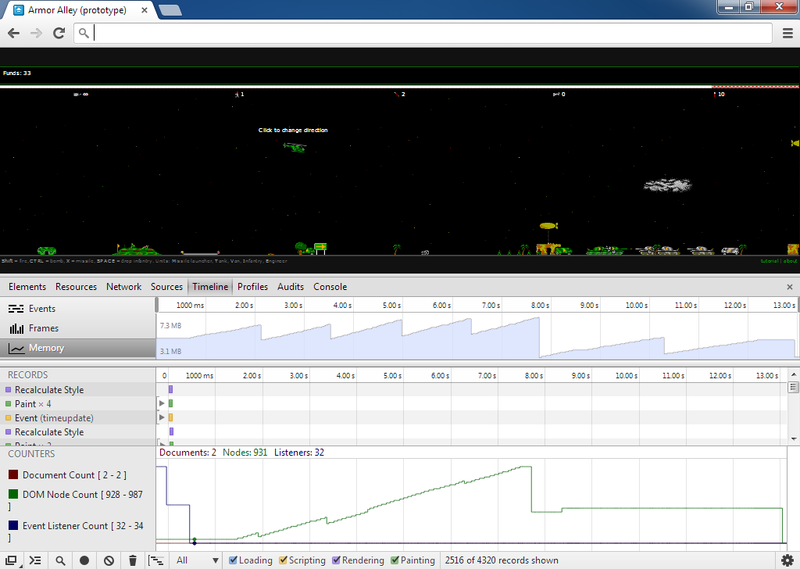 Note that most frames are < 16 ms, 60+ fps. Web Prototype without GPU-accelerated transform: translate3d() - note lots of red (expensive repaint), and very slow frames. This is why you don't create temporary cloned objects inside hot loops; that's a lot of garbage. 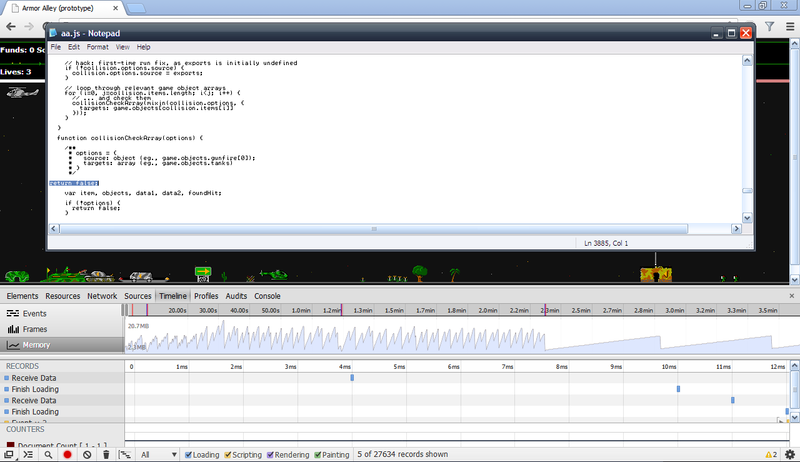 Screenshot shows "spikey" RAM use and garbage collection events before the expensive function is shunted via return false. The proper fix involved changes to avoid object creation. Memory and DOM node count rising and falling over time, with ideal case of DOM nodes (green line) being properly GCed as JS objects and DOM nodes they reference are cleaned up. Normal gameplay and memory allocation is illustrated above in blue, along with a growing number of DOM Node references (green.) In this case, the helicopter's machine gun fires 64 rounds and nodes are added in linear fashion. When the gunfire objects are destroyed, things settle down and eventually a garbage collection event happens. When JS/DOM nodes are dereferenced via JS object destruction / clean-up, the remaining DOM nodes can be properly garbage collected. A natural GC event reflects this at the mid-point, followed by the remainder of the new nodes with a manual GC event invoked toward the end. Chrome DevTools' "Detached Dom Trees" under the Heap Snapshot Profile section can also come in handy for finding leaked DOM nodes; the detached DOM is included under the Containment View. At time of writing (Nov 1, 2013) there might be a bug related to GPU-accelerated DOM nodes not being GCed, or simply not being reflected in the Chrome DevTools graphs. See #304689 for details. Actually, quite dumb. "Rule-based logic" is a more appropriate description of this implementation. Smart Missiles: Make a beeline, plus minor deviation with acceleration changes, toward target. Enemy helicopter: Target nearby cloud, balloon, tanks or player's helicopter if in range. Fixed acceleration rate, normalizes to 0 when "close enough" to target. Returns to base when out of ammo + bombs, fuel, or heavily damaged. Does not dodge targets nor obstacles. Enemy can hide in clouds, will bomb passing tanks within range if applicable. 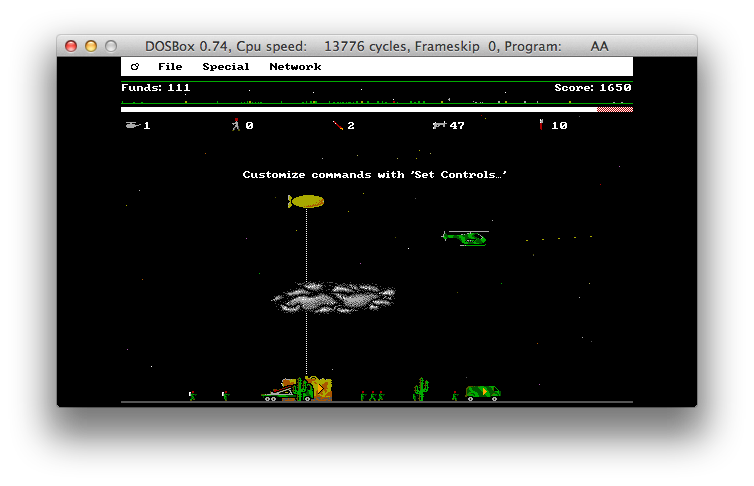 "Dogfight mode": Aim to align with player helicopter. Fire gun when within range. If player is directly underneath, try bombing. Disourages direct fly-over / fly-under. Enemy convoy building / ordering: "MTVIE" sequence at fixed intervals - one every few minutes, depending on available funds. Enemy helicopter has slight speed advantage, making it harder to chase or run from. While using GPU transform: translate, on Chrome: Odd/occasional redraw issues found if style.left/top or transformOrigin not initially assigned. Logical; otherwise browser says, "transform this element relative to what?" ... Recommendation: Apply initial top/left 0px and/or transform-origin values in CSS. Sound greatly enhances the game experience. Original 8-bit sounds could not be re-licensed; modern replacements (and new sounds) were mixed in from numerous Creative Commons and free sources on freesound.org. The hi-fi sounds made it more fun to blow up things, in particular. Collision detection is largely just math. Caching / invalidation would probably be more expensive, not worth the effort. Ditto for other simple coordinate checks, e.g., object nearby / on-screen / targeting. Most time is spent in GPU/hardware, performing draw / layout / render operations. Common methods: animate(), hit(), die() etc. Object arrays (vans, tanks, bunkers) + single top-level controller, loop which calls animate() on each item and removes "dead" items accordingly. Collision accepts object exports (interface), standard properties like data and hit(). hit() accepts optional point value, and source/target object. In some cases, both objects can be damaged or destroyed. JS swapping CSS class names based on state: .enemy, .dying, .dead and so forth. frameCount-based intervals setting animation + behaviour rate, e.g., move() every frame, fire() only twice a second, detect enemies once a second etc. Nearby & "collision" configuration - easily determine "who gets fired at", eg., tanks -> infantry. Default "lookahead" affects vehicle's ability to "see" in front of it. "utils" for basic DOM events, CSS class name manipulation, node tree removal. Revisit object, data & function inheritance - could most all game objects inherit from a "sprite" base of some sort? Smarter collision detection algorithms could be researched and implemented. Different "exports" / API per-object? More abstraction, less assumption about css, data, dom? Better "sprite" abstraction per-object. Easier DOM manipulation? Avoid writing any setInterval() / setTimeout() calls. Currently used for post-explosion delays before object destruction (DOM node removal, object clean-up.) Smarter: Use existing animation loop to apply an action after a given number of frames, and destroy object that way. This has been partially implemented. Re-review object creation, memory allocation and garbage collection. Currently not too bad, but always room for improvement. Object pooling could be used for common objects like gunfire, etc. Further optimization considerations: Image sprites and sound sprites, where applicable. Remove animated .GIFs in favour of sprites + CSS animations, if it is faster / smoother. Tutorial Mode: Guided introduction to game mechanics, tasks and basic strategies. Enemy helicopter can hide in clouds, and can bomb passing tanks ("Stealth cloud bombing mode".) Alternately, player can pass over enemy anti-aircraft guns, missile launchers and the enemy base, as well as the enemy helicopter, undetected. Adds a fun element to the game. Sneaky. Additional sound effects for helicopter, parachute infantry, infantry gunfire, van jamming and shrapnel hit. Multiplayer. Not for lack of interest; I think it'd be great, just don't have the time. Photoset: Notes, development screenshots, debugging etc.